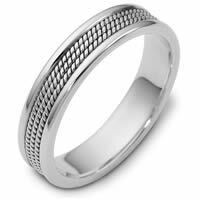 Palladium, hand made comfort fit, 6.0 mm wide wedding band. 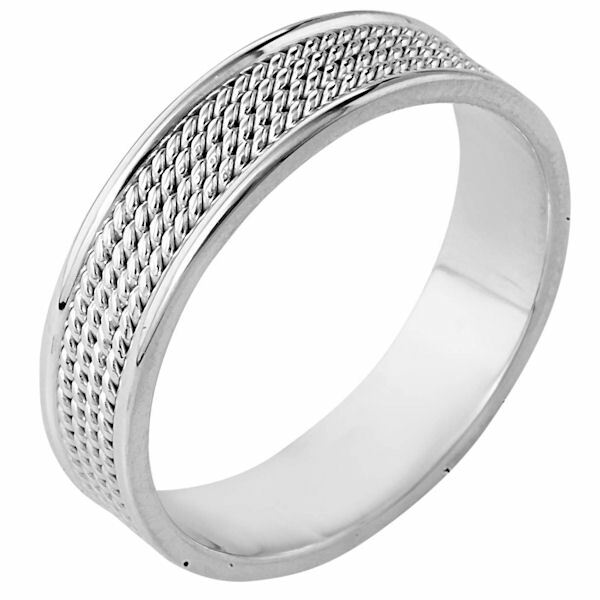 The ring has 4 hand made ropes in the center with a polished finish. The edges are polished. Different finishes may be selected or specified. 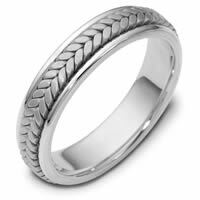 I HAD A REALLY GOOD EXPERIENCE WITH THIS COMPANY EASY TO ORDER AND MY WEDDING BANDS ARRIVED ON TIME. HAPPY CAMPERS. WILL RECOMMEND THEM. I was extremely skeptical at first. It took me a month to finally decide to give weddingbands.com a try. I am so happy I did. I purchased my fiance band .50 Platinum ring and it came out beautiful. It was exactly what was pictured. The customer service is impeccable. They ran into an issue with the engraving I requested and a I received a prompt phone call to clear the matter. I will absolutly buy from this company again. 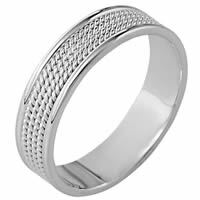 In the process of deciding on my band. Give them a try you will be more than Happy! Highly recommend this website for anyone looking to purchase a top quality ring for value. They were efficient fast and provided excellent customer service. We took a gamble and purchased online from New Zealand hoping the company was trustworthy and the products well made. 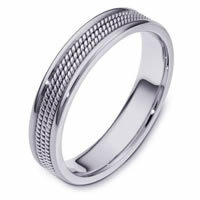 We can safely say Weddingbands.com is both!! One of the rings didnt quite look like the other because of proportionality so when we passed comment back to their team they offered to remake it free of charge and send us the replacement as quickly as possible. The replacement ring arrived in record time and as perfect as the picture on their website. Professional friendly courteous value for money and really well made. Thank you Weddingbands.com you have impressed us and you have two big friends here in New Zealand. We will spread the good word. Thanks to Edessa too for being so efficient and friendly throughout the transaction.